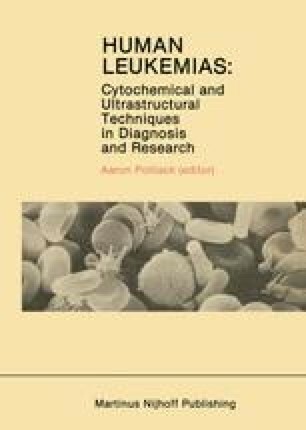 Advances in morphological techniques, such as the application of cytochemistry at electron microscope (EM) level and of immunological methods, particularly the development of monoclonal antibodies against antigens of hemopoietic cells, have proved to be of value in the characterization of normal and leukemic cells [1–3]. Several tracers such as immunoperoxidase, ferritin or colloidal gold particles  have been used at EM level to localize antigenic sites in different tissues. The immunoperoxidase method has been widely used in hematological material for the study of D-cell neoplasias . Since colloidal gold particles were proposed as a tracer for transmission electron microscopy (TEM)  and later for scanning electron microscopy (SEM)  studies with this technique in conjunction with monoclonal antibodies have been confined to light microscopy (LM) observations of normal lymphocytes [7, 8].